"Kim and Jason" is a journey to the universe known as childhood. Kim is a spunky package of innocence, unabashed confidence and hopeless naiveté. Jason is a little boy with uncontrollable hair, usually enveloped in a world of dreams and fantasy. 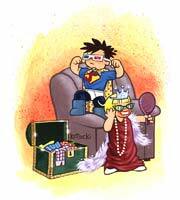 Together as friends, they explore the world of imagination and try to make straight the crooked world of "grown-ups". First conceived in 1997, Jason Kotecki's creation has captured the hearts of many people, and has transformed the way many adults look at childhood. Instead of simply reminiscing about the past, adults have been able to step into childhood's shoes through the eyes of Kim and Jason, remembering what it was like to be little with a big imagination.